Click here for the Terwilliger Environmental Award nomination page! Prepare your class for an upcoming Terwilliger Nature Van visit or use these Student Activity Sheets to engage students in the study of the natural world for any curriculum. Each grade-appropriate resource will open as a PDF for easy downloading or printing. Produced specifically for Grades K- 5, these wonderful nature education films feature acclaimed naturalist-teacher and conservationist, Elizabeth Terwilliger. Her unique interactive, multi-sensory teaching techniques inspire children to respect and appreciate Nature. As adults, they will be prepared to make responsible decisions to protect and preserve our natural environment. 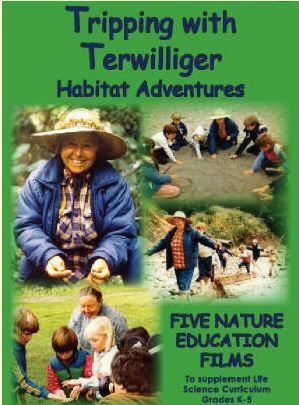 School librarians may request a free DVD of the Tripping with Terwilliger Habitat Adventure Series at terwilligerfilms.org. From Highway 101 take the Paradise Drive exit. From the south, getting into the right lane, turn right at the stop light. Bear right onto San Clemente Drive. At the next stop light the road becomes Paradise Drive. Continue through the next light. After Westward Drive on the right, look for the Ring Mountain Preserve sign on the right (approximately 1-1/2 miles from Hwy 101. Park along the road. If coming on a long trip, please stop at San Clemente Park for the bathrooms. Click for a printable PDF of these directions. Drive about .5 miles. At the stoplight, turn left. Drive about 2.7 miles. At the top of the hill, turn right towards Muir Woods/Mount Tamalpais. Drive about 0.8 miles. At the 4-way intersection, turn left towards Muir Woods (oncoming traffic has the right of way!). Continue down the hill about 1.6 miles. The regular Muir Woods parking lot is at the bottom of the hill, on a sharp turn, on your right. Continue left past this lot to the ADDITIONAL PARKING LOT. Meet the Nature Guides just inside this parking lot. Take Interstate 80 East from the Bay Bridge. Drive about 2.7 miles. At the top of the hill, tum right towards Muir WoodslMount Tamalpais. Drive about. 5 miles. At the stoplight, turn left. Drive about 2.7 miles. At the top of the hill, turn right towards Muir WoodslMount Tamalpais. Drive about 0.8 miles. At the 4-way intersection, turn left towards Muir Woods (oncoming traffic has the right ofwayl). Continue down the hill about 1.6 miles. The regular Muir Woods parking lot is at the bottom ofthe hill, on a sharp tum, on your right. Continue left past this lot to the ADDITIONAL PARKING LOT. Meet the Nature Guides just inside this parking lot. Important: ALL drivers must enter Spring Lake Park via Hoen/Newanga Entrance, then follow the signs to the Jackrabbit Par Course area. DO NOT go to the Discovery Center! From Highway 101, take the Highway 12 Exit. Follow Hwy 12 East to first stop light (Farmer’s Lane). Continue straight at stop light onto Hoen Ave. Follow Hoen Ave past Summerfield Rd. Just after you pass Summerfield Rd., turn left onto Newanga Ave. Follow Newanga as it bends to the right (following the Spring Lake Park signs) and continue ? miles to the Spring Lake County Regional Park entrance kiosk. After the entrance kiosk, turn left and follow the winding narrow road 1/2 mile to the boat launch parking lot. Turn left at the Jackrabbit Par Course sign. Park on the left near the Jackrabbit Picnic Area and avoid reserved parking spaces near the picnic tables to the right. If the parking on the left is full, use the spaces nearer to the boat ramp. Meet on the lawn below the restroom area. Take the North San Pedro Roadexitj . The gate will be open; please enter and drive to the large parking area by the picnic tables.